Today I am so excited to announce two projects that I’ve been working on now for months. I am so thrilled to be able to say that Hope For Nannies is now launched! And with that, comes the premier package from the Hope For Nannies program – an executive resumé + job search training program designed specially for nannies. Resumé Reboot is a 21 day self paced e-course made by NANNY SHECANDO, uniquely for other nannies & babysitters, to help navigate the job search process so that you can live the career of your dreams. First, let’s talk about Hope For Nannies. 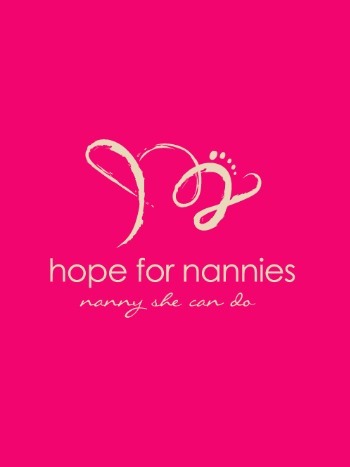 Hope For Nannies is a global movement inspiring nannies to take their careers and make it big. Own it, be proud of it, make it shine, and build your career. Why? Because you are NOT “just the nanny.” You are The Nanny. Own it! Why Hope For Nannies? Because I totally get it. I’m a nanny too. I’ve been there, fighting for my career, and I had to overcome those struggles on my own without the support of the nanny community. It’s been my mission since the creation of this blog to establish a network of like-minded people and to generate support for the international nanny community. Hope For Nannies helps you to invest in yourself, to realise the full potential of your career in the in-home childcare services industry, and to generate a professional career platform for nannies worldwide. The job hunt, like any hunt, is not for the faint of heart. It can render you discouraged, unsure, and terribly disorganised. Reboot your resumé and live the life of your dreams! Resumé Reboot is a 21 day tailor made e-course specially for you. 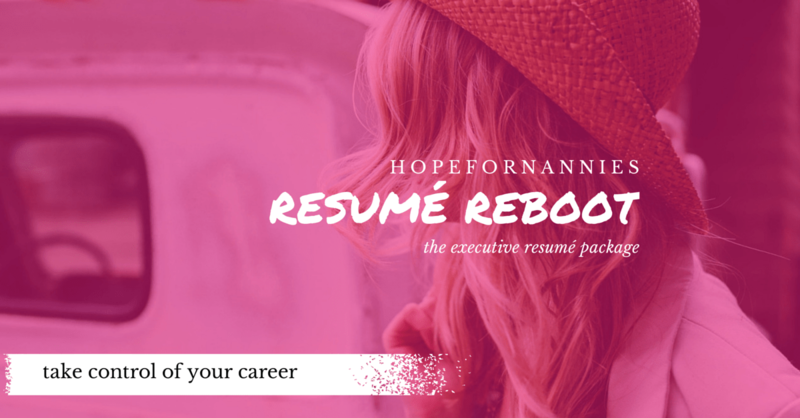 In Resumé Reboot you will go from redefining your career goals so that you can repurpose your nanny experience, all the way to rocking the job interview and securing your dream job (that’s on your terms)! You will have access to a powerhouse of knowledge and key tools to targeted to take control of your career. You will uncover the tools to own your decisions and use your nanny experience to define the path that’s right for you. You’ll realise the value of investing in yourself and know your worth. This course is uniquely designed for women like me. Awesome soon-to-be rockstar nannies, who are intent in investing in yourself, intent on becoming secure in who you are, in embracing your dreams, and enabling your career on your terms. This course speaks to nannies ready to take control of their life. Nannies who are hungry to learn, hungry to grow, and willing to take the jump. 21 days of tailor made nanny content to help you navigate your experience to align with job search. Cost: $199. Click here to purchase! If you’re a nanny, babysitter, childcare worker, or agency looking to onboard a program for your nannies – this is the course for you. Now is the time to take control your career, and treat it like the respectable profession it is. You are NOT “just the nanny.” You are The Nanny. Own it. Be courageous. In today’s Nanny Spotlight column, I’m super excited to bring you Anna Massie, owner and founder of The Corporate Kid. Anna is a truly remarkable woman, an absolute power house, and has big plans for the evolution of the nanny industry within Australia. Her company, The Corporate Kid, is Australia’s newest nanny agency and is specifically working to ease the transition for women and mother’s to return to the workplace. Through tailored services and employment agreements, The Corporate Kid works alongside corporate companies to offer outstanding childcare and nanny services. Plus, Anna is also a superstar nanny herself! Anna Massie, owner + founder The Corporate Kid. Photo – source. Tell us about The Corporate Kid. What’s your mission, and what are you working towards? T.C.K. is working towards being located in corporate companies around Australia. The aim is to enable employers to assist their employees with more flexibility by providing a nanny as part of an employee benefit. My mission is primarily focussed on assisting mums return back to work easily, where by the organisation pays the placement fee. Pending individual arrangements, they may also cover the ongoing costs. This is so their female employees can return to work quicker and without the stress of negotiating childcare waiting lists. I am working towards positioning T.C.K within many national companies, which will enable more opportunities for employees to relocate interstate knowing that their children are always going to be well managed and requirements are met wherever they are. I also want to build the nanny profession of Australia. Through my work with T.C.K., hopefully the wider community can view being a nanny as a legitimate career choice – professional and rewarding. I want nannies to be proud to say “I am a nanny”. What’s your philosophy and approach towards the job of caring for kids (and supporting those awesome working mums)? It starts with the emotional connection between families and nannies, without this being genuine and real, the relationship will never last. Luckily, somehow I just have this intuition that can connect ‘like minded’ nannies and families. Because of my own experience, I can understand what families are truly looking for and whether nannies do have that professional approach to fulfilling the role required. All nannies have to be switched on and have a savvy mindset, and this I can pick up on from the moment I speak with them. This is where my approach is different to other agencies, I hand source and make contact with the nannies instead of leaving them to contact me. I generally source professional career focussed nannies as they naturally think beyond what is required. They’re also usually beautiful people who love to work with kids. So my philosophy lies in spending time truly getting to know the parents and then hand picking nannies and getting to know them. What were you doing before you left to start The Corporate Kid? While developing and planning T.C.K. I was working in corporate for an ASX listed company. I was the ‘go to’ person to get anything organised in the head office. I was good at what I did, I was dedicated, but I also new I wasn’t going to be able to climb much further! It was working here that gave me the idea for T.C.K and that companies needed to develop more opportunities to make it easier for women to transition back to work after having children. Prior to this, I was an International nanny for 18 months in London and 6 months in Istanbul. What skills did you bring with you to start T.C.K. and what business skills are you working on developing? Luckily I am pretty business savvy; I take validated risks and I don’t get stressed! I brought to T.C.K. the mindset of a career oriented women so therefore I can understand what other career minded women need. From a business perspective, this is crucial to knowing and understanding my customers. As an entrepreneur, and sole business owner, it also helps to have a strong work ethic, time management skills and the ability to believe in myself to see things through. But like many, I’ve had to learn how to maximise social media, build websites and write legal documentation. When setting up The Corporate Kid, what have been some of the biggest challenges? The challenge arose in the first 3 months – my business model was completely wrong! My original plan was to employ nannies from all over Australia to create this amazing organisation. But like many, financials are tricky and even though I had outsourced a HR provider, I could not get my head around how the figures were going to add up. After about three to four months of operations I was able to refine to more of a recruitment model – which has been so perfect for allowing me to enter the corporate sectors. Other challenges have been my huge vision and thinking the more money you throw at it, the faster it ‘will happen’. So not true! Passion and a genuine approach are how it will happen. I’ve also learnt that it’s crucial to make wise choices in how you spend your money. Outsourcing can save time but you can go and write the bones of legal documents yourself and then have them checked and signed off by a lawyer – cutting down costs dramatically. What was it like to start your own business, particularly as a woman? EASY! For me there were no other thoughts, it was really just about when was the right time to take the risk. I really began the ground work of my business when I was 14, and by 17 I was sourcing nannies and babysitter for over 30 families. I have always known what I am good at and so that is what I focussed on to get started. Confidence, vision and belief are integral to getting anything started. I’ve been talking about the professional nanny and style lately, what’s your take on workplace fashion? Do you have certain expectations when interviewing prospective nannies? I have a very big focus on the ‘professional nanny’ look and feel. Because the profession is still developing and being regulated in Australia, it’s an area we can be very instrumental in creating. Unfortunately, many people think they can be a nanny to earn some extra money and this is where the level of style fades. Those that want to be a professional nanny know what’s appropriate to wear, and that you can be a super stylish nanny and still look professional. I believe as long as you’re wearing jeans or pants you’re half way there. Complete the look with a pair of trainers or sandals, a top and maybe some jewellery and you’re looking elegant, professional and comfy! At T.C.K., who are your main clients? Currently my main clients are first time mums and dads who are looking for more flexibility in their family life. They prefer a nanny to come into their home rather than sending their child to childcare. Having just placed our services into an interior design firm in Brisbane I would say we’re now on the verge of working with a lot more corporates and rolling out across Australia. So you own and run The Corporate Kid, but you also nanny. How does that work? Yes I do! I am a big believer that you should practise what you preach. If I want to be giving the best service to families, then I need to also be up-skilling myself to keep in tune with what the families needs are. My week comprises of nannying a 14 yr old girl who lives with her dad. He is a busy professional and so I bring the flexibility he requires to know that his daughter is always safe, happy, and being looked after. She knows that she can call on me at anytime! It is a juggle, especially around school holidays. But it has it’s perks as well. Being an entrepreneur, I don’t work a typical 9-5 day, and so nannying is a great way to be able to do two jobs at once! I try my best to stick to routine. I am an early riser, I can complete anything at 5am but never at 10pm. So I try to get up and get the most important tasks for the day done first thing – it takes me a lot less time when my mind is fresh and on fire! I then go and exercise for about an hour and set the rest of my priorities for the day. This involves making contact with customers and sourcing awesome nannies. At the moment I’m building the Anna Massie brand, so a lot of my time goes into the personal touches that I provide to ensure my clients are well looked after. And of course, afternoons are spent nannying and hanging out with the 14-year-old. Tell us, what’s on your desk right now? FLOWERS! They make me happy when I spend a lot of time on my own. I always write before I think, so there’s always paper and a pen. Also a huge iMac computer (that I wish I knew how to make the most use out of)! First up at Bikram Yoga and then in a cafe in Rozelle (inner west suburb of Sydney). I love this downtime to sit and read the papers. I love reading the papers, and gain a lot of my ideas and knowledge for how to refine my services to better serve families and companies from these saturday morning sessions. So you hail from Brisbane. What’s Brisbane’s best keep secret? Yes I do, Brisbane is a beautiful place! I lived in Clayfield and there is an amazing bakery/cafe in Albion called Brewbakers. Otherwise, you can’t go past James Street. It has a great mix of specialty stores, markets and cafés, galleries, designer clothing and home wares – truly everything to make you happy! What’s your favourite thing to do with kids whilst out and about in Brisbane? In Brisbane, I like to take kids to the farmers markets. I love taking them to choose what produce to buy for the weekly meals. I believe it’s essential to teach kids life skills and get them out and about. Plus it’s just a great atmosphere and fun for them and myself! To date it would be securing that first company and really seeing the benefits my services will bring to the organisation and their employees. How would you like to see T.C.K. evolve in the next 6 -12 months? I plan for T.C.K. to be positioned in 6-10 companies and placing an average of 5 nannies a week. I’m about to launch a referral program. I have a huge vision for where this business will go and the benefits that we can bring to families, companies and nannies. Ooh where to begin! I have many ideas, but the one that I would LOVE to do is to create a fashion line with Seed Heritage! Do you have any advice for women starting out in their 1st or 2nd job? Go out of your way to help others. People like helpful people, and quite often spending the time to assist your manager, you will learn a great deal from doing so. I got myself into a very high assistant role where I was dealing with company wide change, purely from being helpful and getting the job done. Biggest piece of advice for new nannies starting out? Make sure you are truly passionate about working with kids. Think about your “why” and the value that you could bring to kids lives each day. This is the difference between a good nanny and an exceptional nanny. James Street Brisbane, The Urban Picnic. Photo – Source. 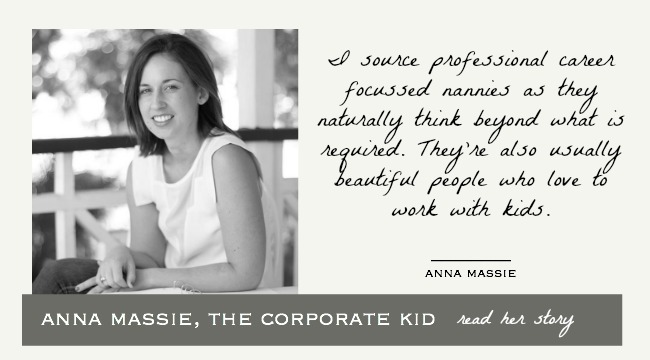 Anna Massie, owner The Corporate Kid. Photo – Snap Factory Photography. Production – Joyce Ong. Welcome to another issue of The Nanny Spotlight – an exclusive and behind the scenes look into the lives of some of the international nanny industry’s most notable rockstar nannies! It’s always a pleasure to chat with these seriously inspiring career professionals. Today I’m excited to introduce you to Lani Hopcroft. Lani and I recently met through a mutual contact (my good friend Anna over at The Corporate Kid), and I must thank her. 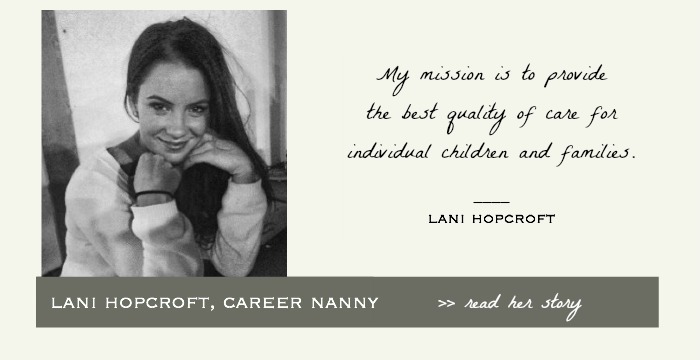 I’ve long been saying that this nanny industry needs support, connection, friendship and community and well, Lani and I are on the same page. I managed to speak to Lani whilst she was over in London recently. 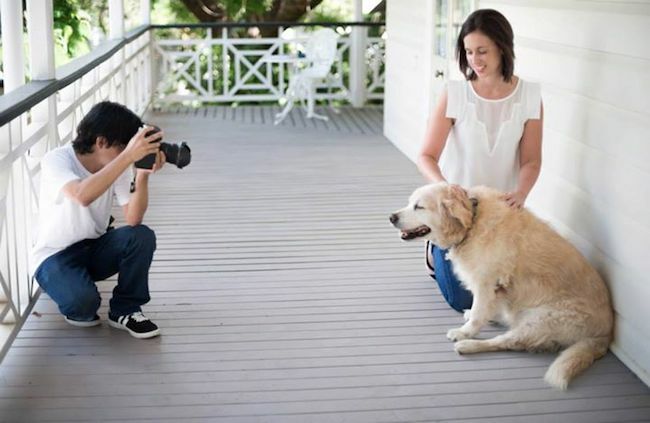 She’d just started with a new family and lucky her, this new job involves loads of travel. This nanny life sure has it’s perks! 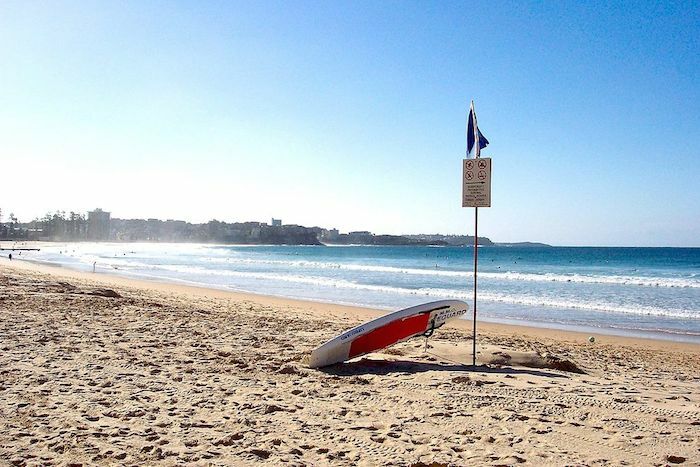 Career nanny Lani is based in Sydney, Australia when she’s not travelling for work. Photo – Source. At time of interview, Lani was in London with her nanny family. Photo – Lani Hopcroft. 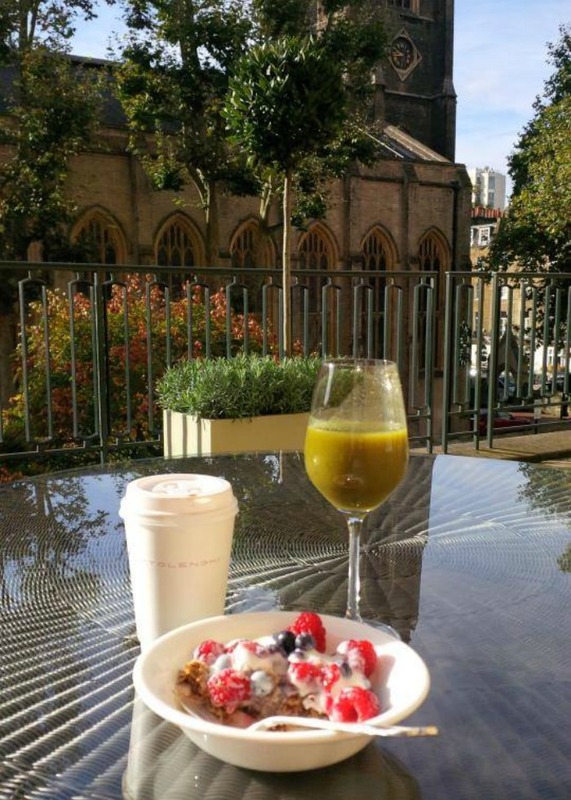 Perks of the nanny life include breakfast at a prestigious London hotel. Photo – Lani Hopcroft. Tell us a little about your background, what led you to becoming a nanny? I started nannying when I was 17. I was finishing school and my children services course, and I decided that my love for babysitting could be extended. I realised that I could be more than just “the casual babysitter.” Two days after I finished my HSC (Year 12 formal qualifications), I started my first nannying job. I was thrown in the deep end and I quickly found myself managing the home and four amazing boys all under five. Do you specialise in a particular age of children or type of nanny role? My experience varies. I have worked with almost all ages and stages in life and don’t think I could say I have a favourite. All have their pros and cons. I have cared for so many different children with individual needs, both physical and intellectual disabilities and I feel that it is what fuels me in what I do. No one day is the same as the last. I’m currently looking after a newborn – I absolutely adore him. Can you tell us about your approach towards the role of caring for kids? I’m able to draw upon my own family values, and mix these more “old school perspectives” with a modern-day approach towards raising children. I firmly believe that getting dirty and having fun is important for kids, but ensuring that a good education is in place is equally so. I also believe that manners are taught to children and it is up to the parents, families, and carers to impress these onto the kids. I am a firm yet fun and young nanny. Once our jobs are done, I love to get the kids out and into the sunshine or the puddles in our wellies. Have you faced any major challenges in your nanny career so far? Whilst I have maintained a great relationship with almost all of my families, I have had to resign from positions because I felt that I just wasn’t the right fit for them. It is important to know that it is ok to do this as a nanny. Otherwise our quality of care will suffer and we become unhappy in our placement. You recently just started with a new family. Why the change? Today marks one week in my new position and I have never felt more comfortable in a job. The family is amazing, they operate as a team. They work together as well as with me to make sure that everything is done and that the child has the best opportunity to grow and develop. I’m looking after a 4 month old boy who is divine! So you’re in London right now as part of your work. How’s that? Yes – I am in London right now and loving it! London is an amazing place for both big kids and little kids. Hyde Park is full of amazing creatures and humans. From the Queen’s horses and all the Queen’s men (haven’t spotted Humpty yet), to squirrels and Pippa Middleton running on the track, it has been a beautiful place to picnic in the autumn sun on the grass. 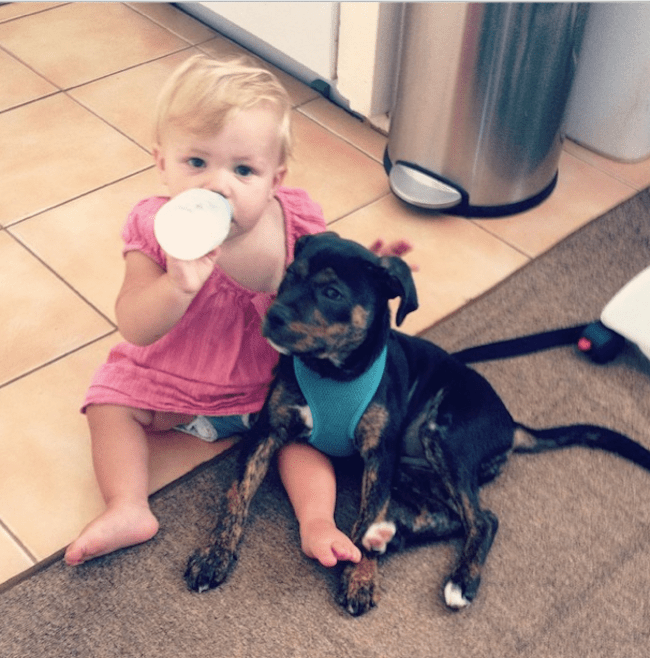 What’s it like to be with The Corporate Kid – an Australian based nanny agency? The Corporate Kid contacted me on behalf of the family I now work for and did all the inventory work. What was a very quick process was also a very rewarding one. Anna was there for me every step of the way to make sure I was feeling good about the career move. Being part of the T.C.K team is a good feeling, you know you have support to ask any question and have it answered it with respect. In terms of career progression, do you stay in contact with your previous nanny families? I have a fantastic and ongoing list of families that I have babysat and nannied for. I always take the time to do causal babysitting for them as it’s an amazing feeling to see how much my previous charges have continued to grow and learn! I try to take the kids out to the movies here and there, so I don’t just up and walk out of their lives. I think moving on from one job to another and leaving the kids is the hardest part of being a nanny. 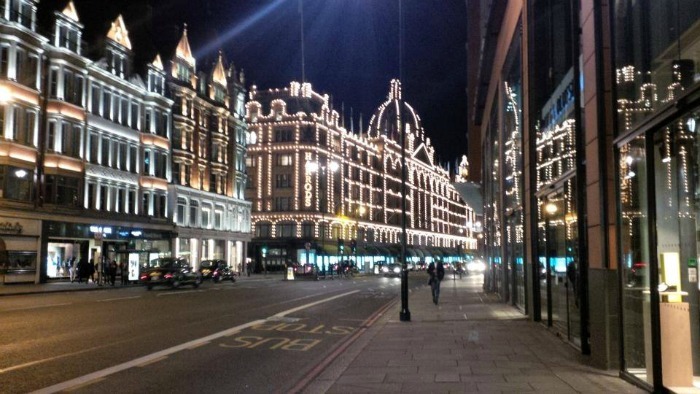 The shopping in London is said to be amazing! Photo – Lani Hopcroft. 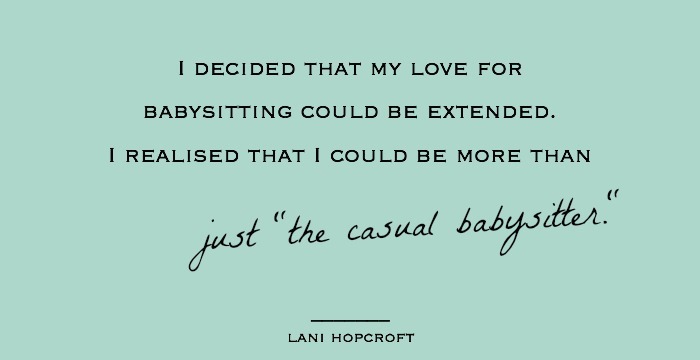 Lani has a modern approach to raising children with “old school” values. Photo – Lani Hopcroft. What’s your take on the current nanny industry in Australia + the community? I feel that in the last year there has been a boom in the “community feel” within the nanny industry, particularly in Australia. I have met many nannies and we all seem to go through the same things, and it is really helpful and comforting to know that there are others just like me. It’s comforting to know that if I have a question, some one will answer it. Although there are so many groups and places we as nannies can go, it is a lonely job at times. There can be hours where you do nothing but sing and talk “baby talk,” but I am so lucky that all of my families are amazing and we get along really well. We can chat here and there and communicate during the day with the funny antics of the kids and enjoy a professional, and amicable relationship. I wholeheartedly think there is a difference between being a nanny in Australia, and a nanny in other countries. I’ve seen documentaries from all around the world, and I think we have it very good in Australia. Some other places treat their nannies with respect, but not the same kind of respect we benefit from here. We become part of the family. What’s your favourite thing to do with the kids whilst out and about? I love getting the kids in my care down to the beach. I think it is so important to make them aware of the water – to be water safe and to learn and understand our limits when it comes to water play. I am a strong swimmer, and yet I have a vivid memory of being pulled from the bottom of a pool when I was a young child. The sooner the kids become safe and confident around water the better! Where do you shop for tools of the trade? I tend to stroll shops and draw inspiration from what I find. Think Spotlight, RiotArt & Craft and cheap dollar stores. I also use Pinterest. I love DIY projects that I can do with the kids. I recently made soy candles with a little girl I was caring for – perfect Christmas gifts! Even though being a nanny can be quite isolating, I really just love being on a deck chair in the middle of a quiet beach. Ice cold grapes and a good books top it off. Wherever that’s on offer, I’m there! The simple fact that I love what I do! Every day is different and poses new challenges and it means that I don’t actually get bored. I love that I get to watch little humans grow. It’s something that a parent only really experiences once, but as a nanny you get to experience this process with each new family. Best piece of advice for new nannies starting out in this industry? The dream opportunity is waiting for you. Don’t be scared, we all start somewhere! Connect with Lani Hopcroft on Instagram + Pinterest. 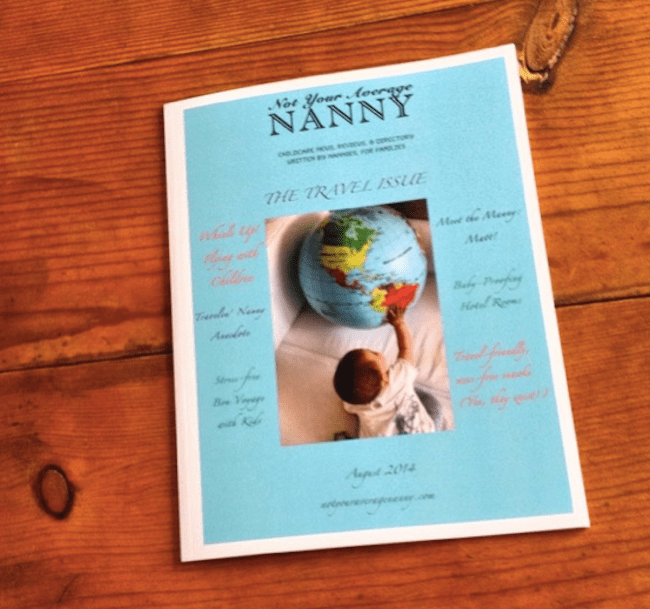 >>> Have you ever travelled with your nanny family? If you’d like to participate in The Nanny Spotlight, please email me. If you’re a rockstar in your field, be it a nanny or sitter, childcare worker, primary teacher, nanny industry expert, nanny agency or children’s author – I’m looking to hear from you! 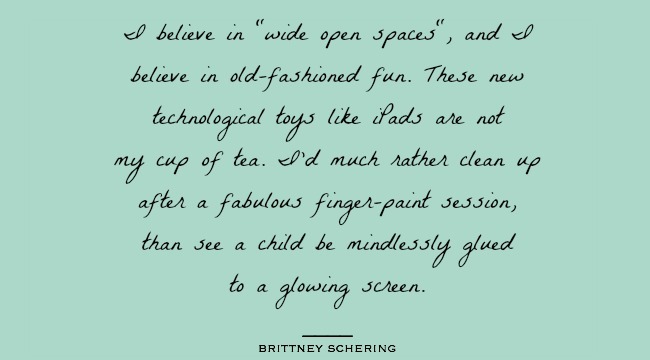 In another issue of the Nanny Industry Spotlight, we’re again crossing over to the Untied States (LA to be exact) to bring you Brittney Schering. Brittney is a professional nanny, a freelance writer and also the founder of new magazine; Not Your Average Nanny Magazine. It’s a magazine catered to both nannies and parents, and helps to open communication dialogues between both parties so that we may all better understand all that goes on in the daily nanny life. I’ve submitted many articles, like the importance of children exploring wide open spaces, to this new magazine and I look forward to seeing it grow as it continues to develop. I seriously don’t know where Brittney gets her energy from, she runs across town all day looking after kids from multiple families and then still meets her writing deadlines. Plus she even has a gorgeous little puppy in tow most days! 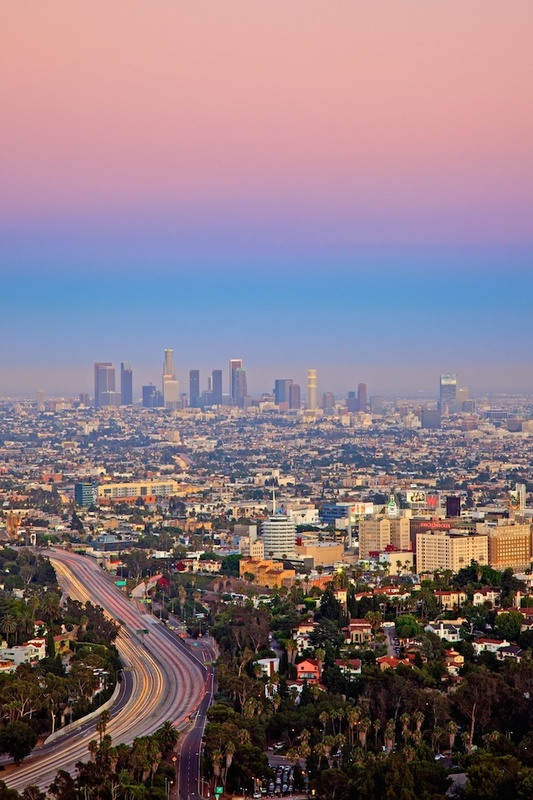 Los Angeles, Brittney Schering’s place she calls “home”. Photo – Eric. Los Angeles. Photo – Somesuch Guide. 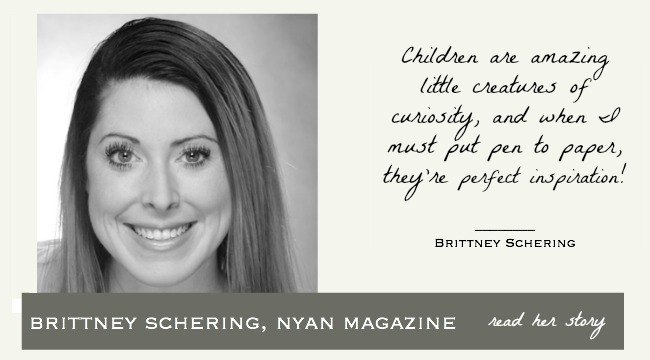 Brittney Schering, career nanny & founder of Not Your Average Nanny Magazine. Photo – Brittney Schering. Tell us a little about your background, what path led you to becoming a nanny? I have always loved working with children, even when I was still a child myself. In 4th and 5th grade, I’d spend my summers assisting neighbours with their little toddlers – not seeing what I was doing as work, but merely fun. I was fascinated with babies and so eager to help in any way possible. As I grew up, that never changed. I began to babysit at age 12, and then at age 23, I started to nanny full-time after graduating from college. It is a perfect profession to be paired with writing. Children are amazing little creatures of curiosity, and when I must put pen to paper in the evenings after a long working day in the nanny life, they’re perfect inspiration! What does your current nanny role involve? I work for a few families. My day starts at 6am with a two-year-old little girl. I wake her up and get her ready for school and take her there by 7:30. Then I dart across town to Venice, where I care for two children; a newly three-year old boy and an 11-month old girl from 8am to 4pm. After this I shoot back over to the other side of town to pick up the two-year-old from school at 5:30pm, and take her home to start the evening routine. I usually leave and head home for the evening around 9:30pm. I have two other families that I also work for occasionally and on weekends. My schedule is jam-packed, seven days a week. I don’t sleep! Can you describe the style of your work and your philosophy towards the role of caring for kids? I’m very natural and maternal, I operate under a philosophy of leading by example, and I feel that manners are incredibly important. I love to teach children from a young age that politeness goes a long way – saying please and thank you, and more importantly, “may I.” I like to show children how to share their toys with other kids, and that it is not only the way to make friends, but more importantly, how to keep them! I also believe that giving children space to be themselves is vital. They are their own individual selves and deserve the chance to explore as they wish, so long as their safety isn’t at stake of course. What’s the most challenging thing about your time in the nanny industry, and that you’ve perhaps had to overcome? What’s your take on workplace fashion. Given the LA weather, what’s your go-to nanny outfit? My go-to nanny outfit is generally something comfy but still cute. I like to wear maxi dresses, but because I mainly care for infants and toddlers, I tend to go home a bit messier than I arrived in the morning! I typically wear clothes I don’t care too much about, so that if I am spit up on, or worse, then I won’t get that upset. My daily attire is a decent top and beans, or a t-shirt and yoga pants. I keep it simple and make sure that what I have on won’t limit my mobility, because I am all over the place when working! So you’re a nanny and a writer? How does that work? Yes, it works awesomely, especially when I can work during nap-times. Writing is mostly deadline-based, so I often find myself working on writing projects on the weekends and at night after I get off work. Because I am a freelance writer, I make my own schedule and decide which jobs I can take on and fit into my nanny schedule. The key is to keep a healthy balance between the two. Tell us about your current project; Not Your Average Nanny Magazine. My ultimate writing goal has always been to run a magazine. I toyed with content ideas like music, or arts, or events, and they’d always fall to the wayside. But then I had the vision for a nanny magazine, and I just ran with it. Because the subject matter is so near and dear to my heart, it seemed like something I should have thought of a long time ago! I spent some time prepping for the first issue, and gathering fellow nannies to contribute, and then in April this year our premier issue was published. We’ve now this month just published the 6th consecutive issue and it’s going extremely well. My bachelor’s degree is in Professional Writing, and that helped tremendously with getting the magazine published. Can you give us some insight into the creative process? Do you work alone, collaborate or outsource parts of the magazine’s production? It may sound silly, but for me, the creative process happens in the shower. I also find I tend to do a lot of my best work when sitting in a coffee shop – it keeps me on task and focussed with plenty of coffee. I also get a lot of my ideas while I’m at work nannying, and I have to quickly write them down before I forget them. I do a lot of my work alone, although right now, the magazine would not exist without collaboration. It is a part of magazine culture – you must have an open mind and be able to work with others in order to run a proper, engaging magazine. What can readers expect from the next issue of NYAN Magazine? We’ve a big focus on “mannies” at the moment, and have just featured another outstanding manny who’s based in London. We also have a strong focus on travel and the various travel woes that nannies experience when on holidays with their work families, as well as a strong push of education, healthy lifestyle and of course the “back to school” theme. How would you like to see things evolve in the next 6-12 months? I would love to see us partner with a bigger magazine such as Parenting Magazine LA or LA Parents. Maybe even a renowned nanny agency to help us grow. I don’t really have a “typical” day of any kind. Because my jobs are always changing and I’m constantly taking on new work, my day is all over the place at the moment. I balance it by taking my MacBook to work, and during nap time, I work on NYAN Magazine as well as my freelance work. Thankfully, the pressure of the deadline is what drives my greatest work. So I am used to working within a small time window. Just quickly, you mentioned that you take your puppy to work with you. How does that play out? Are the kids and parents OK with their being a puppy around? The kids responded differently to the pup. The 1-year-old was fearlessly affectionate towards her, the 3-year-old was apprehensive at first (but is slowly coming around & becoming affectionate), and the parents were a little concerned at first. They were concerned that given she was a puppy, she would require so much attention which could distract attention from the kids. Now they all love her as much as if Frida [the puppy] were their own; much the same as I love their babies as if they were mine. It has worked out really well! Because she is a young pup, we have been able to train her to be sweet & gentle with the children. It’s perhaps not all that conventional, and some families may not be ok with it, but we are all happy and it’s great to see both the kids and pup play together and learn to take care of each other. Brittney Schering’s new puppy. Photo – Brittney Schering. On the way to work with new puppy, “Frida”. Photo – Brittney Schering. 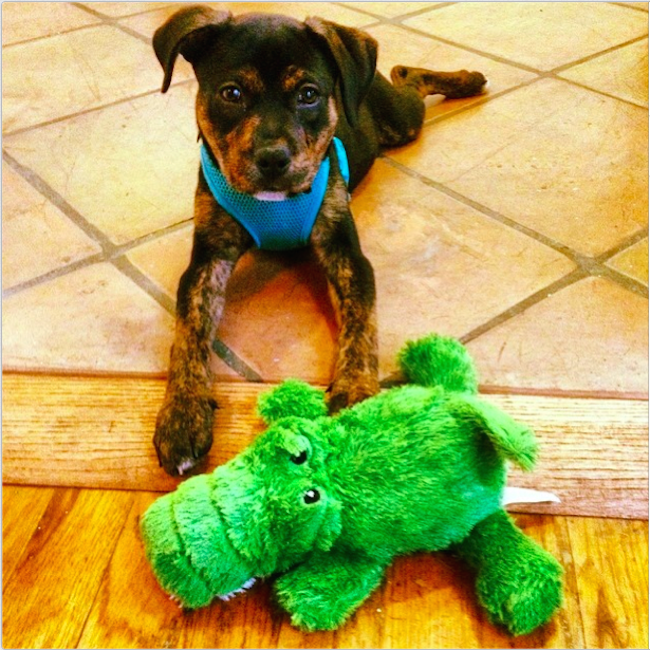 Puppy “Friday” and a little girl in Brittney’s care (permission to publish granted). Photo – Brittney Schering. Inside Miracle Mile Toys, LA. Photo – Miracle Mile Toys. So you’re based in Los Angeles, California. Why LA? I absolutely love this city. I was born and raised in a tiny town called Trenton, Michigan [on the other side of the country] but I always had my heart set on the west coast. As a teen I’d dream of living in California. After graduating from college I made my first big move, and relocated to New York City. Although it was a profound place, it didn’t feel like “home” to me. Los Angeles is a different story however. I felt like I belonged here the moment I arrived! 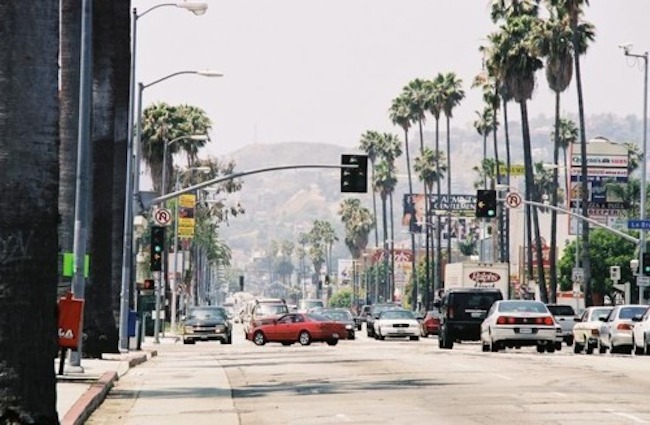 Where do you shop in LA for the tools of your trade? Miracle Mile Toys is a personal favourite. And of course I love Barnes & Noble, and Target is always a great place for affordable kids toys and craft products. What and where was the last great meal you ate in LA? It was actually at an Italian spot on La Brea called Amalfi Restaurant. My boyfriend and I were thrift shopping at Buffalo Exchange right next door. It was a matter of convenience and curiosity and it worked out perfectly! 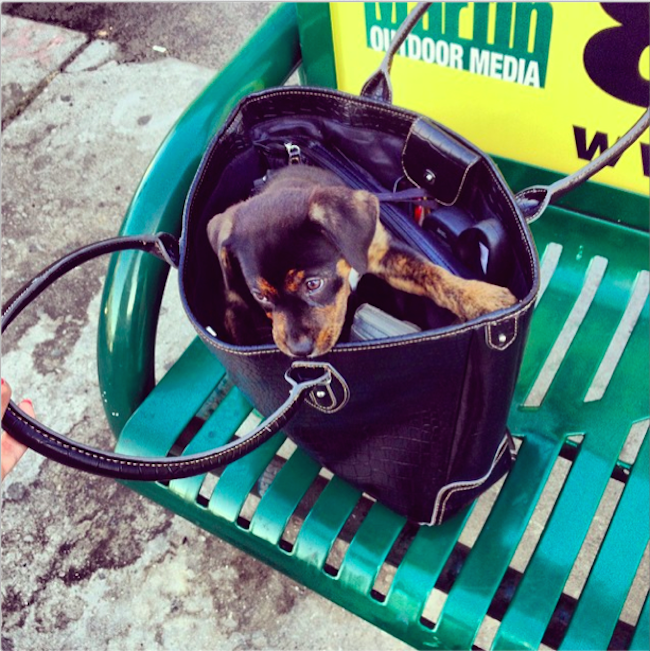 You’d find me walking to the café with my new little puppy, Frida, before heading off to work. On the off chance that I don’t have to nanny, I’d be having breakfast with my boyfriend at one of our favourite local spots. Your biggest personal and professional goals you’d like to achieve in the next little bit? Essentially, to become closer to “entrepreneurial freedom”, whilst also taking the time to care for myself. I’d like to develop a personal agenda, with big picture goals as well as short-term tasks, as a self-love practice to keep me on the right trajectory. Working with children, and helping to mould their minds for the future, is truly the best. It’s the most rewarding opportunity I could ever imagine, and I absolutely love that it’s my responsibility to help raise so many awesome little kids. Be careful with what you say “Yes” to. The job itself – working with kids – is an awesome one, but it’s also a position where you can easily be taken advantage of (although not always intentionally so). Set your boundaries early on, constantly educate yourself, and being a strong and clear communicator is truly essential! Peekaboo Playland, a great place for kids in LA! Photo – Peekaboo Playland. Because I’m big into community, and sharing the love, and supporting the nanny industry, I’ve been all about getting to know other superstars in the nanny industry. I want to shine a light on them, to highlight them, to let you get to know them, and share with you their magic secrets and tricks of the trade. The Nanny Spotlight at Nanny Shecando is something I’m really passionate about, and I’ve got some fabulous names lined up over the next few months. To get involved, please contact me with subject title nanny spotlight. To participate in the nanny spotlight, please contact me. If you’re a rock star in your field, be it a nanny or sitter, childcare worker, primary teacher, nanny industry expert, nanny agency or children’s author, I want to hear from you! Today I have something very special to share with you. I’m so proud to finally commence a new project on the blog. Because I’m big into community, and sharing the love, and supporting the nanny industry, I’ve been all about getting to know other superstars in the nanny industry. I want to shine a light on them, to highlight them, to let you get to know them, and share with you their magic secrets and tricks of the trade. The Nanny Spotlight at Nanny Shecando is something I’m really passionate about, and I’ve got some fabulous names lined up over the next few months. To get involved, please contact me with subject title nanny spotlight. To kick things off, I bring you Nanny Da Poppins. 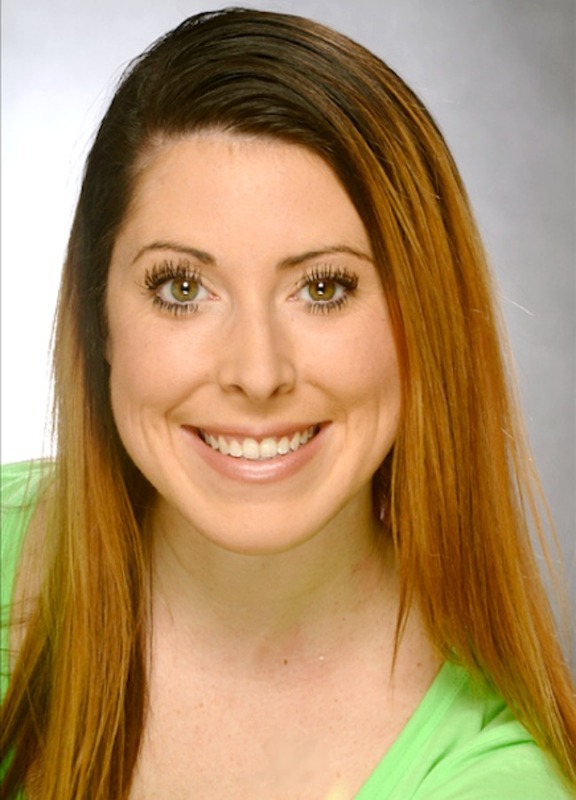 Dana hails from Vancouver, Washington, is a graduate of the prestigious Northwest Nanny institute, blogs at Da Poppins, has over 20 years experience in the industry and is a strong advocate for the benefit of reading and instilling the love for a good book! Be prepared lovely readers, this is a long interview to kick things off. Grab yourself a coffee, and sit down to be immersed in the life of a truly inspirational lady. The books at Kazoodle Toys, Portland. Photo – Da Poppins. Production Hope/NannyShecando. I babysat in high school, which was really my first exposure since I don’t have younger siblings or cousins. At around age 18 I started to explore the idea of becoming a nanny. I’m a creative person who loves to laugh, and kids are the best kind of people for creativity and laughter. You graduated from the prestigious Northwest Nanny Institute. What made you choose Northwest Nannies? I wasn’t ready to study at college. I wasn’t sure who or what I wanted to be. But I loved kids, and I knew I could do well with kids. There is a big difference between being a Nanny and being a babysitter and I needed some training. What kind of training and support did you receive? I highly recommend Nanny School. I’ve met graduates from NNI that already had Early Childhood Education degrees and other college degrees but they went to NNI anyway because the school teaches about being a Professional Career Nanny. It’s a 30 week training course that offers everything a Nanny should know, from child Development to career planning. They also offer a unique training and hands on experience Practicum with local families. This, for me was one of the most important parts of the school. I learned so much from the Mom’s I worked with. For over 20 years NNI has helped me find nanny families who treat me as a professional and do not try to take advantage of my time or my skills, the way I know some families do. I’ve never had a “bad” experience. It’s actually shocking to me when I read about what some nannies put up with. NNI has a screening process in place for families, and their fee weeds out all those who might under value my position. I currently care for two little blond headed girls, who I have been with for almost 3 years. But as the girls are now entering full-time school, I know I will be transitioning to fewer hours. I also have a Certified Nursing Assistant Certificate, so I also do Elder Care part-time in the evenings. Some of my same principles for being a Nanny still apply, I’m just a care-giver for adults. Now that the girls are older (three and five), I often drive them to school and classes. A short day may only be four hours. A long day starts at 6:30am and goes until 3:30pm. One girl goes to school until 12:30 so the other child and I do fun things around town until it’s time for pick up. Then it’s off to Ballet class. How would you describe the style of your work? Do you have a philosophy and approach towards the job of caring for kids? I’ve never been afraid to be silly, to get dirty or look ridiculous if it is going to make a child laugh. You can imagine how much this helps me relate to kids of all ages. It definitely makes me stand out to parents. 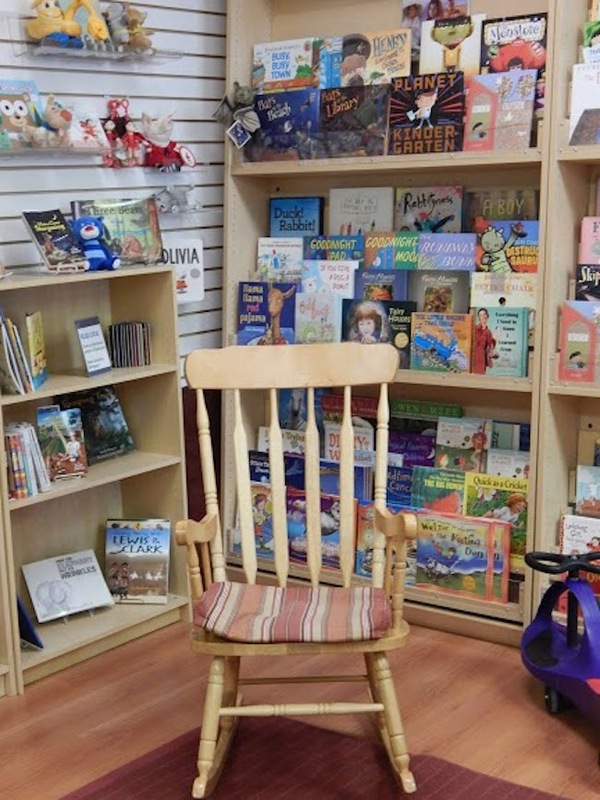 Even with babies, I talk, sing, and interact all day long with at least three or four book readings outside of nap-time. I like to plan a daily craft and if it’s a long day, an outing. What’s your favourite children’s story book and why? “I wish I could pick just one book. But that’s impossible!” I love classic fairy tales and fables. Some of these retellings have the most beautiful illustrations and many of them are long enough to be good bedtime stories. I wish current picture books were more like Kipling’s “Just-So” stories. He wasn’t afraid of language and big words. Using them in playful ways that never spoke down to kids, but instead, encouraged them to think big thoughts. Big words and big concepts were his playthings, and he used them like toys in his stories. I love that. One of my favorite books, “Who’s in Rabbit’s House,” has lines that will be forever stuck in my head. Written by Verna Ardema it is a great picture book for kindergarteners, first and second graders. The story has some repetition, is full of jokes kids get, has a riddle and great illustrations. This book can be made in to a play for kids to perform, or combined with a mask making craft that kids love. Plus, it has an unusual setting that will make youngsters curious about the world. Right now I am crushing on the recently published “The Grudge Keeper,” by Mara Rockliff. There is something about the style of the illustrations that makes me want to take extra time and study them. The story is not only fun to read, it teaches something without being preachy. 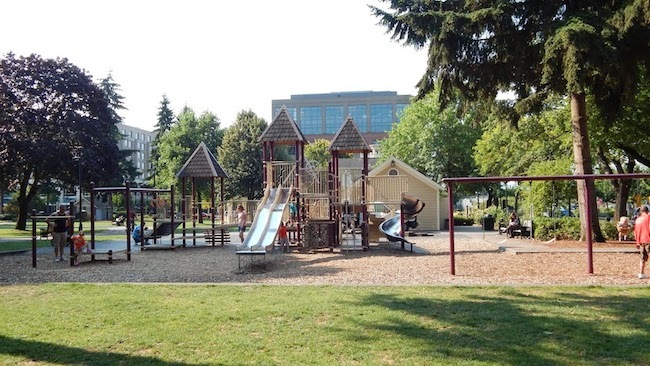 Kids playground at Ester Short Park, Vancouver. Photo – Da Poppins. Prodcution – Hope/NannyShecando. 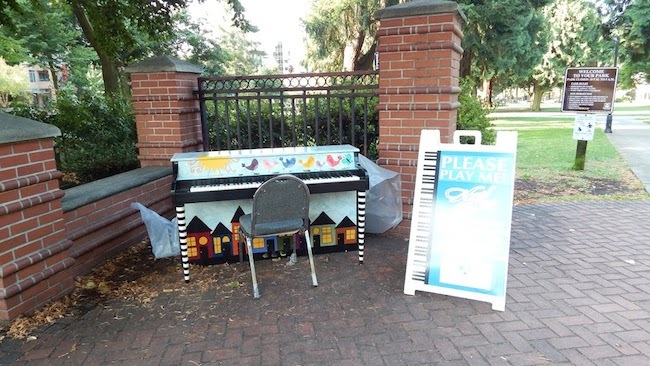 Free Play Piano at Ester Short Park, Vancouver. Photo – Da Poppins. Production – Hope/NannyShecando. What are some of the biggest challenges you’ve faced working as a nanny? I’ve been talking about professional development recently, what’s your take on establishing yourself as a career nanny? 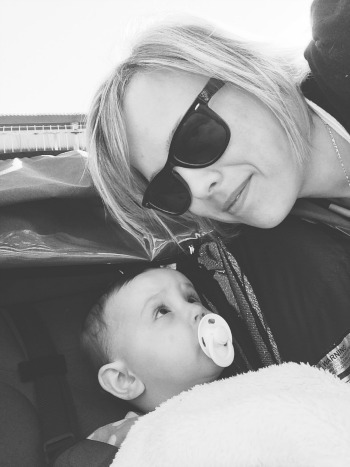 So you’re a nanny and a mother, and a blogger, and a super crafty person. How do you manage all of that? I think women can do many things, have many passions, but not all at the same time. When I am working on a craft project or a blog post, I’m not cleaning the house. When I am out with the kids, I’m not folding the laundry. And when I’m at work, well, I’m not at home getting all that other stuff done. I have to focus on the task in front of me, not all the other things that need to be done at the same time. My kids help and they are getting fairly self-sufficient, and my husband is awesome. He supports me in my job and my crafts by making dinner. Often. Tell us about the DA Poppins blog. Years ago my friend started blogging and she was always telling me about the circle of friends. So I tried it out as a way to practice my writing – with the goal of appealing to an audience. I wanted to share life stories and make people laugh. I blog about the things I am passionate about: telling stories, sharing stories, reading stories, children, family life, and scrapbooking. 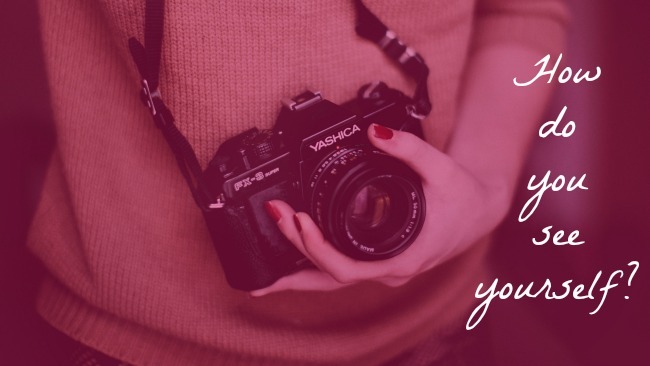 Where do you draw inspiration from when creating content for the blog? When I’m not posting, I am writing blogs in my head on the way to work. I’m editing how-to’s and humour stories, parenting tips, nanny insights, sharing scrapbook pages and stories about wonderful people I know. How do you see the blog evolving over the next 12 months? I joined social media to widen my appeal. I’m working on positioning the “Da Poppins” brand. 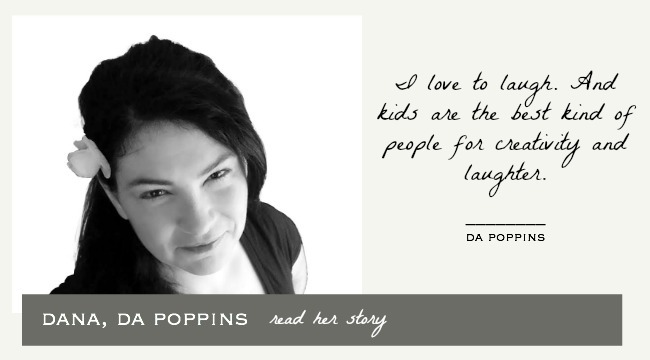 I want [Dapoppins] to be known as this Nanny insider, Mom, creative person who loves children, and as an advocate for reading aloud and early literacy. I want to push that Dapoppins is parent friendly, but she is also a kid’s best friend. The Da Poppins blog. Photo – Da Poppins. You’re a scrapbook enthusiast. Where did that stem from, and what do you usually create? Thank you so much for asking me this question! Some might think it such a cliché – “Mom Scrapbooker.” But I just enjoy paper and photographs. It really is about telling the personal story for me. I made my first scrapbook when my first son was born and I haven’t been able to stop telling the story! I put a lot of our history in the scrapbooks, the kids lives, and all the paper that generates. I’ve made personal “story books” for the kids. One son loved his so much he proudly took it to show and tell. That just filled my heart so much, that he liked what I was doing for him. Have you always been interested in arts and craft? After reading East of Eden by John Steinbeck in high school, I discovered that good writing was art. It was painting landscapes, faces, emotions, and refining them with the English language. I’ve always dreamed of doing that. I just finished reading The Secret Life of Bees by Sue Monk Kidd. There were several moments where I had to stop and savor the brush stroke of her sentences. I can’t write like that, but I can make a canvas with layers, colour and textures. I can tell a quirky story with scrapbook paper. I can express all my emotion with paper, glue, and scissors and not be limited by my actual skills. Scrapbooking is only as difficult as you want it to be. What do you do to recharge the batteries and reconnect with your quiet side? I pour everything I have into work – I am performing, protecting and providing. I must have a good attitude and never lose my patience. This is so very exhausting. Outsiders don’t always see this. I’m paid to have all the answers and to not get angry. Maybe that seems like a high standard to some, but in reality, it is what makes me a professional. It takes a lot of energy to always be performing for my audience of children, maintaining self-control while at the same time staying one step ahead of the little ones I am taking care of. When I get done for the day, I’m done with talking, sharing, and giving for a moment. I hug the kids, kiss my husband; they go back to what they are doing and I grab some alone time. I power up with prayer time and church time, and as a lazy introvert I recharge with long naps and lots of alone time. 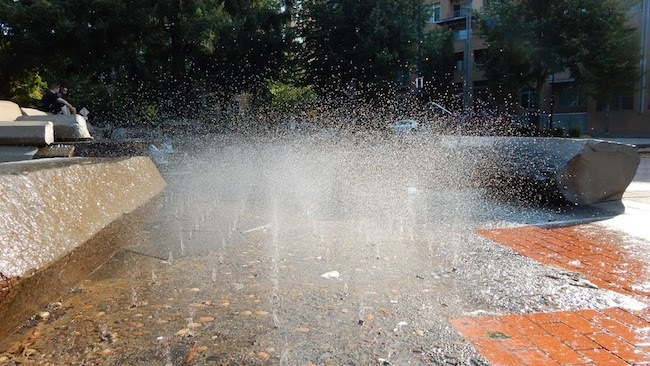 The Vancouver Water Fountain. Fun for kids! Photo – Da Poppins. Production – Hope/NannyShecando. 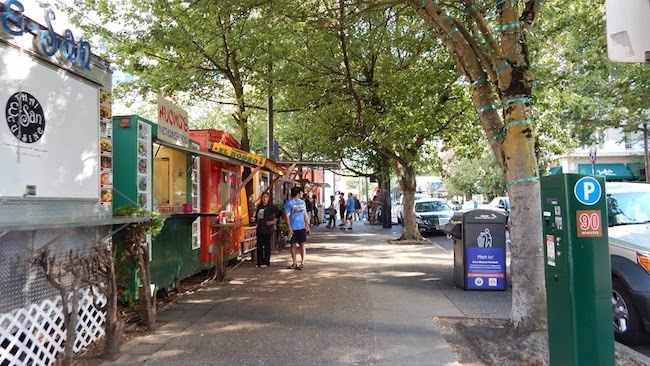 Food carts in Portland. Photo – Da Poppins. Production – Hope/NannyShecando. Da Poppins recommends Kazoodles Toy Store for tools of the trade in Oregon. Photo – Da Poppins. Vancouver Library. Photo – Da Poppins. Production – Hope/NannyShecando. So you’re based in Vancouver, Washington. What’s your take on it? Vancouver is 30 minutes from Portland, Oregon. 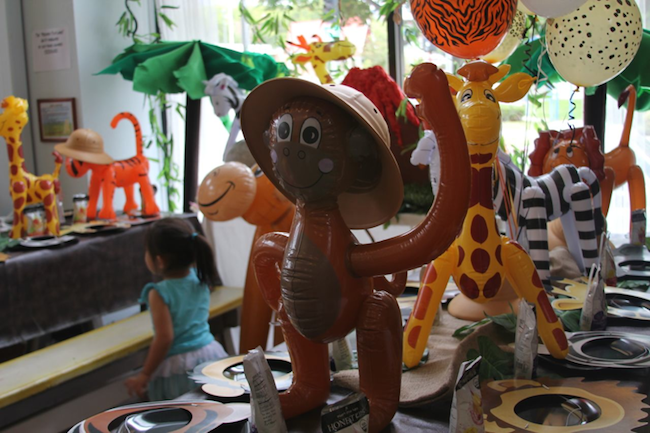 This whole area is filled with indoor and outdoor kid activities – I love it! 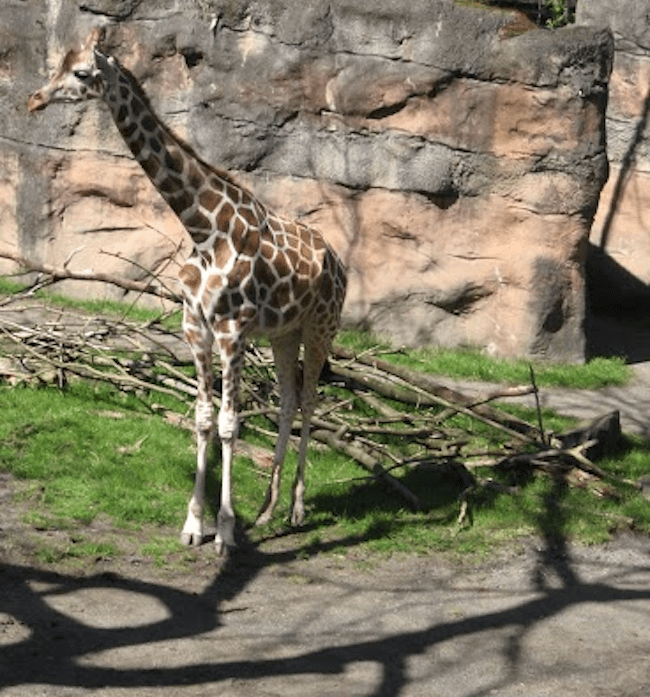 The Oregon Zoo, Children’s Museum and Science Museum are all great! Year long families passes are the best buy, and most families I’ve worked with buy them routinely. There are hundreds of parks, water fountains to play in, walks to go on and places to explore. The library system is amazing, with a huge book selection and weekly free activities. Most of the athletic gyms all have great kids programs that teach things like gymnastics, ballet, rock climbing and karate from pre-school to pre-teen. Where do you shop in your area for tools of the trade? My favourite places to shop for art is at the Saturday Market or one of the many local Farmers Markets. 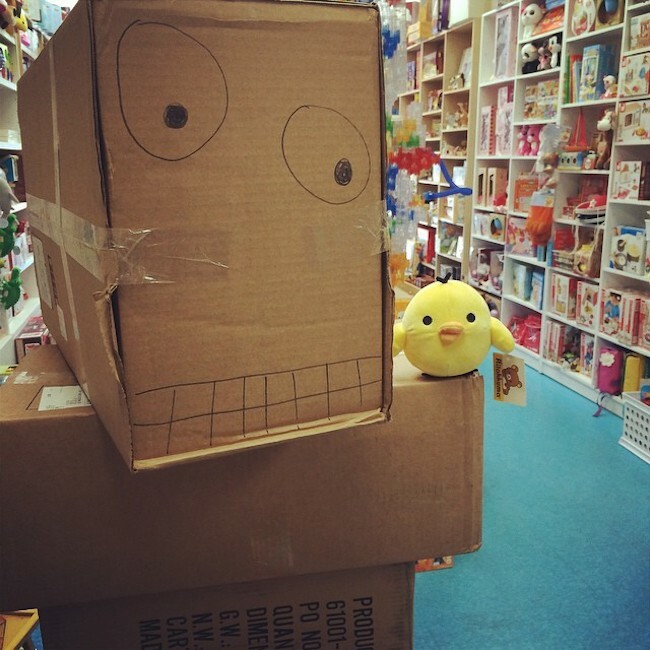 It’s where I can find some very unusual, whimsical stuff made locally by people just like me. I love that. 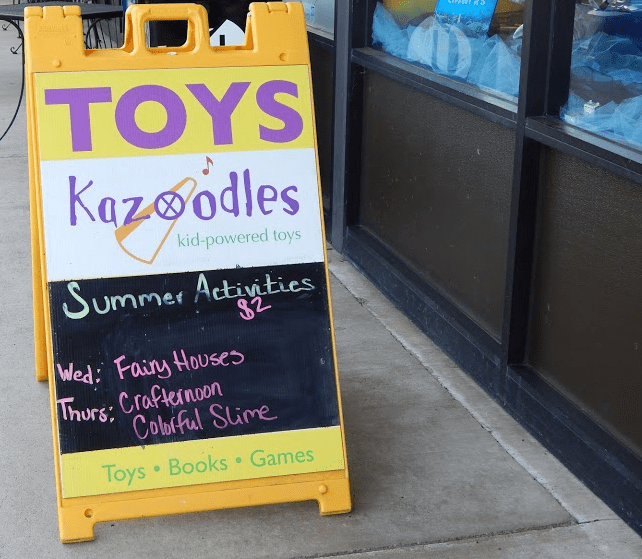 Kazoodles is a locally owned store that carries tons of games, toys, interactive activates, and books. And of course Powell’s World of Books in Portland, which is packed with interesting stuff (and books). You’re 80 years old and you are writing yourself a letter titled “Secrets of a life well lived.” What does it say? I actually have a post coming up on the blog soon about this! I’ve known some truly interesting and lovely elderly people, my grandparents included, that taught me life can be as fruitful and fun at eighty as it is at twenty. It’s just a different perspective. Be observant and ask lots of questions. Every family has a ton of unwritten rules and habits that are so familiar to them they don’t even think to explain them to the new nanny, especially if this is their first nanny. Giraffe at Portland Zoo. 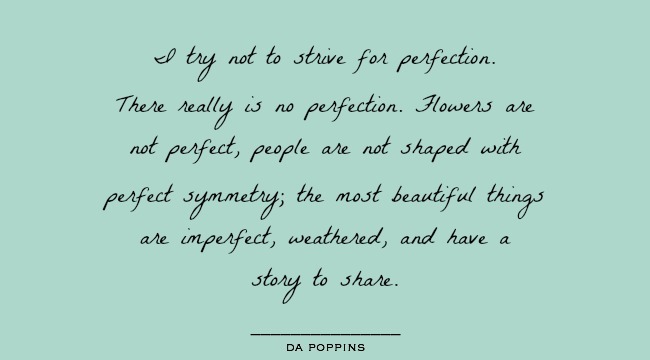 Photo – Da Poppins. Productnio – Hope/NannyShecando. To participate in the nanny spotlight, please contact me. If you’re a rockstar in your field, be it a nanny or sitter, childcare worker, primary teacher, nanny industry expert, nanny agency or children’s author, I want to hear from you!